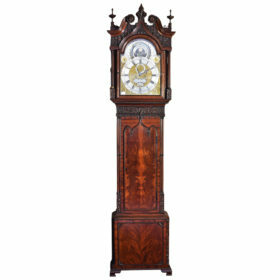 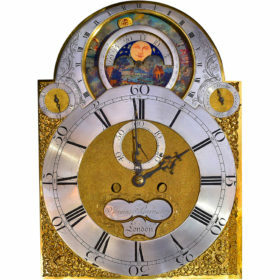 Rare astronomical model English tall case clock. Done in a Chippendale style case crafted out of flame mahogany and boasting a beautiful silvered dial. 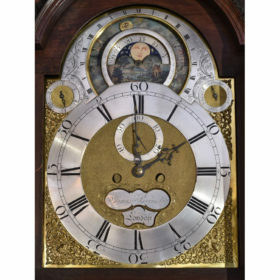 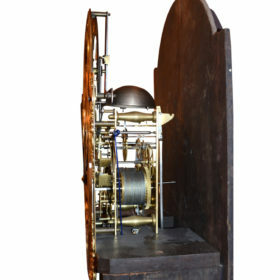 This clock houses a 2 train 5 pillar movement, with 6 spoke wheels and high count pinions, featuring a deadbeat escapement and a worm gear drive to the astronomical calendar. 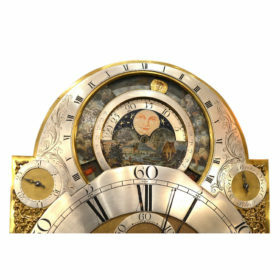 The dials indicating date, moon phase, time of sunrise and sunset through the year, and finish position of the sun above the horizon. 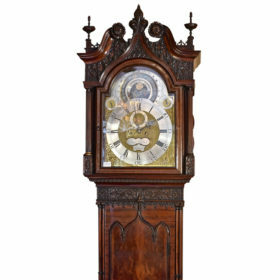 Signed James Barnsley.